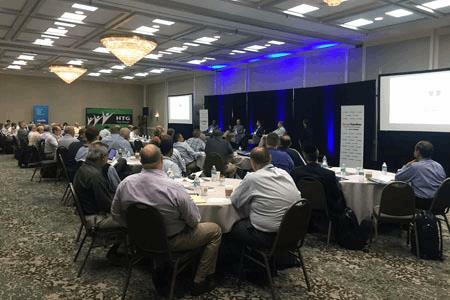 The panel consisted of Stan Louissaint, principal and founder, Fluid Designs; Bruce Nelson, president, Vertical Solutions; Todd Schorle, president, TS Tech Enterprises; and Joe Bacino, CEO, Progression In Technology, LLC. All four panelists started as break/fix but now generate at least half of their revenue from managed services, and all four also had to overcome obstacles to get there. Bacino said the most difficult obstacle to overcome was determining he initial offerings and pricing. “I overthought the process, trying to come up with the perfect plan only to realize there is no perfect plan.” Bacino figured his pricing strategy out by testing with clients, trusting them to provide honest feedback. Panelists split on whether or not to include tiered pricing. “The gold, silver, and bronze packages are gone,” Schorle said. “We have one legacy plan and a flagship plan new clients get – that’s it.” Bacino agreed with Schorle, but Nelson said he “started with one plan, then shifted to tiers. And we’re reevaluating offerings every six months because the market changes so quickly.” For his part, Louissaint offers a hybrid approach tied in to on-site time. Bacino agreed making it hard for a client to get out of a contract is counter-productive, but he makes sure he’s not stuck holding the bag. Ultimately, the panelists all agreed securing a sound master service agreement is more important than the contract anyway. For more information on MSA’s, listen to this podcast. Channel Transitions Philadelphia is being held June 2 at the DoubleTree by Hilton Hotel Philadelphia Airport. It is one of three solution provider-focused conferences Business Solutions Magazine will host in 2016. For more information go to http://www.channeltransitions.com.